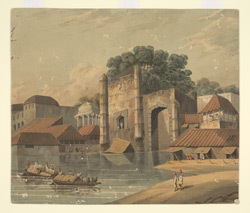 Water-colour painting of an unidentified view of houses and monuments on the banks of a river in India. Groups of figures are fishing, rowing boats and carrying waterpots. c.1840.